Experience unlimited luxury onboard the Paul Gauguin sailing around Polynesia in classic cruise line style. 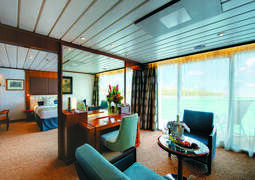 On board the Paul Gauguin you will experience luxury and excellent service unlike any other cruise ship. You will be welcomed by ‘Les Gauguines’ - the hottest entertainment at sea, which you can enjoy in the evening in ‘Le Grand Salon’ where they dance to traditional Polynesian music. During your days at sea try the thrilling water activities like kayaking, sailboarding or diving in the. At night listen to an array of music at different venues: ‘Le Piano Bar’ will play classical music while ‘La Palette’ is a bar and nightclub with an electric atmosphere. Dining on board the Paul Gauguin is superb with a choice of different styles and cuisines. ‘Le Grill’ offers a buffet for breakfast and lunch and traditional Polynesian specialties for dinner. ‘La Veranda’ is a little more sophisticated with ‘bistrot francais’ in the evening. There is an art gallery/museum called ‘Le Fare Tahiti’ on the ship, it explains Polynesian traditions if you enjoy learning about other cultures. Your cruise on board the Paul Gauguin will be an unforgettable experience. 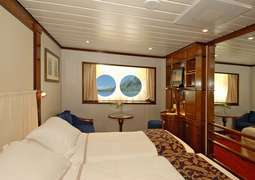 Cabins on board are modern, clean and fully equipped for all your needs such as hairdryers, electric sockets and more. 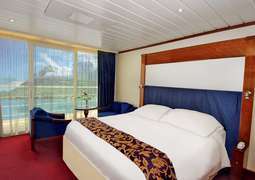 The ship has 166 cabins spread over 8 decks. Most rooms have Wi-Fi access 24 hours a day. On board the Paul Gauguin you can enjoy regional specialties of the Pacific islands in one of the three restaurants. 'La Veranda' offers a reservation only dining venue serving exclusive gourmet cuisine from Jean-Pierre Vigato. 'L'Etolie' is the ships main dining room offering spectacular cuisine with only the finest wines. Buffet breakfasts and Polynesian specialties are available in a more casual setting at 'Le Grill'. During your stay you will have a wide range of services and facilities available to you on board the Paul Gauguin. An exciting and varied entertainment program awaits you in the Piano Bar, the lounge or the Grand Salon. Spend your time by the pool, browse the library or try your luck at the casino. There is also a video rental service, hair salon, boutique, spa and a diving school. A special feature of this ship is the retractable platform at the stern of the ship from where you can snorkel or waterski in the majestic waters of the Pacific. The Paul Gauguin features a luxurious spa, offering a wide range of therapies. Guests can unwind after an exciting onshore excursion with a massage, aromatherapy or one of the other relaxing treatments available.